I'm selling a set of Nausicaa books over at Ebay - for christ's sake someone buy 'em, they're great! My new mini-comic Flotsam and Jetsam has been completed. It's up! Though a bit empty at the mo. Those wishing to investigate my other artistic skillz than the NWN portraits can now settle into Crosbie's Comics Corner. Another little page of comics for you: The Blind Date. Having got hold of a copy of Chester Brown's Louis Riel Comic-strip biography, my mind turned to seeking out some Brighton history which might speculatively be the basis of a comic book. I found a cracking site at My Brighton and Hove which includes pics, bits of history, personal memories and more. Check it out if you're a local. 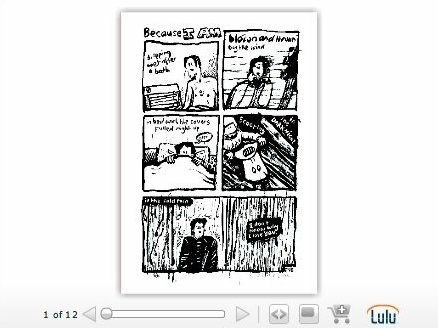 Over at americanelf.com, the wonderful James Kochalka keeps a daily-updated comic strip diary. I mention it here because he's suffering from post-neoannual date amnesia and persistently misdating strips... and, with my English teacher hat on, I couldn't help poking my nose in to his forums to point this out. Well, it's become a bit of a running gag in his strip... and makes me feel like, in my small way, I've been of influence on a work of art. If you appreciated the greatness of Boo in the piccy below, you might also enjoy Boo Goes to the Gym. Blog posts are like buses. None for ages then a whole bunch come along at once. This was an image that went on a t-shirt for my girlfriend this Christmas. A little fiddling with my Blog and finally I've fixed the archive section to the left. Hurrah! This has long been knackered, I've now found out, by Lycos banging script-filled code onto every html page on every site. I've managed to bypass this problem by renaming the archive to .txt so they're not swamped with repeat ads. Don't worry Lycos, I'm not screwing you, just getting my site working again! Long overdue update of my Reading section (on the left) to add a link to the fantastic Blankets by Craig Thompson, which everyone should own. The Blog Cabin has very much become a randomly-updated record of my web browsing rather than any kind of personal diary or online journalism. Fantastic idea from the wonderful Scott McCloud of Understanding Comics fame, and I might have to have a go myself. Check out The 24-Hour Comics Index.